the artist apparently named midzt painted new faces on the building at 3rd and main after the earlier “be merry” piece got painted over. i’ve noticed that he (or she) has a few other pieces around downtown — there was another face on the pacific electric lofts building. there’s also this tag on one of the storefronts near 3rd and main. i really love these green faces. 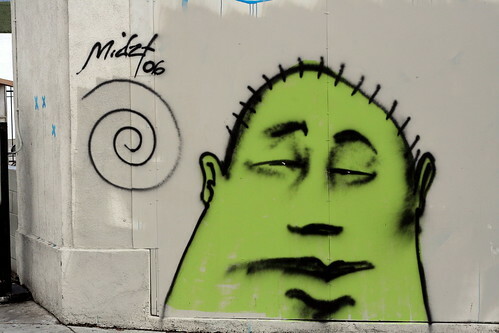 here is a whole collection of murals done by midzt.